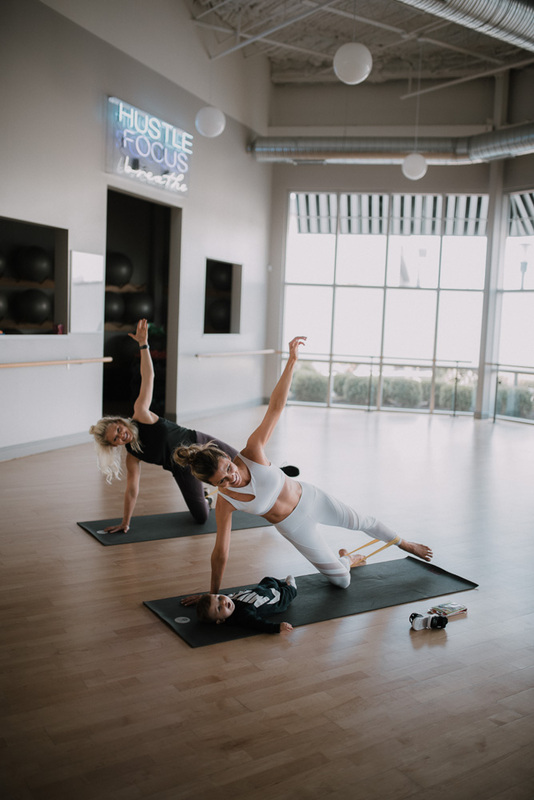 As a new mom, I am literally busy from morning till night, but that doesn’t mean I can’t make time to squeeze in a workout. I prefer working out early before the kids even wake up, but let’s be honest, some days that doesn’t happen and some days I only have maybe 15 mins to get a quick workout in. So today, I am so excited to have Darby Brender, creator of Fusion Fitness (my most favorite workout ever) here to help put together some quick, energizing exercises that you can do at home in minutes. 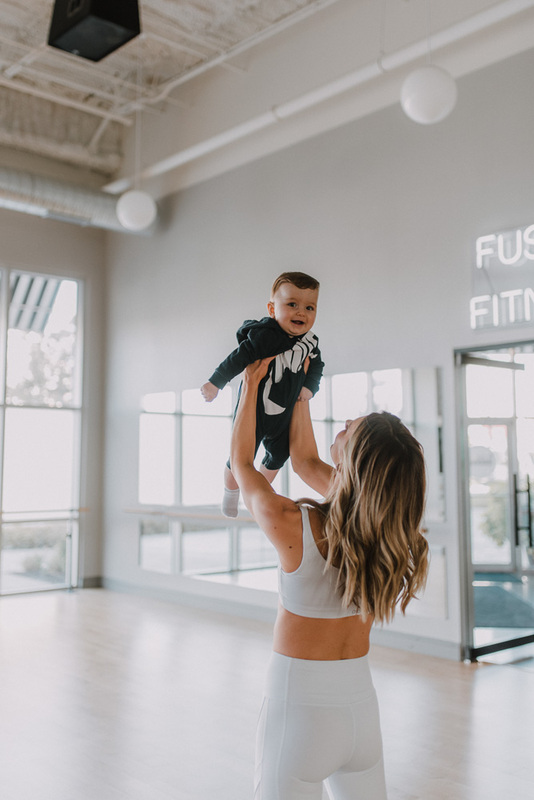 These simple moves work your whole body yet don’t require hours of effort—plus, your baby will be front and center during these moves, so the two of you can bond while you’re working out. Targets abdominals, shoulders, and arms. A. Sit on a mat or a carpet with knees bent. Hold baby facing you, slowly roll back, while the entire time your abs tight. B. Return slowly to starting position and straighten your arms upward without locking your elbows lifting baby up, hold for 5 seconds. Repeat 15xs. A. Stand with your heels shoulder-width apart, holding your baby facing you. B. Slowly bend your knees as if to sit, (you can use a wall for support.) Don’t let knees extend past toes. Hold for ten seconds, then slowly stand up. Work up to ten reps.
A. Start on hands and knees, with your baby on his back below you. Lower your forearms to the floor so that your shoulders are directly above your elbows. Slide your knees back about 12 inches, keeping your back flat and your abs contracted. B. Slowly lower to meet your baby’s face and give him a kiss and raise back up. Repeat for 15 reps.
A. Stand with your feet farther than hip-width apart, turning your toes turned out slightly. Keep your ribs drawn together. Slowly lower your hips by bending at your knees, and pressing your weight into the ball of your foot (heels lifted). Hold baby out in front of you. B. Slowly straighten your legs and squeeze your buttocks to return to standing. A. Stand tall and look straight ahead, holding baby in front of you. Take a large step forward with your right left and bend both knees 90 degrees. Keep your front knee over your ankle as your back knee approaches the floor. Lift baby overhead, without locking elbows, hold for 3 seconds. B. Push off the back leg and step your feet together. Repeat with the opposite leg. Repeat 30xs (15 on each side). A. Have your baby laying on mat right next to you. Lie on your side with your bottom elbow on the ground underneath your shoulder and your forearm perpendicular to your body. Stack your feet together and place your top hand on your hip. Lift your hips up to form a straight line with your body from head to toe. Tighten your abs, glutes and quads. B.Raise your top leg into the air as far as range of motion allows. *Add a band for added resistance. Hold this position. Repeat on your opposite side. Do 1 min each side. I hope that other new moms, new exercisers, or time-crunched folks find this workout to be the answer to their obstacles as well. Ten minutes of movement puts me in a better frame of mind! Plus, if I have 20 minutes (and a happy baby), I just repeat the circuit again! Remember, don’t be too hard on yourself. Your beautiful body, just made a baby (for 9 months) and it is going to take awhile to get back to normal. Just embrace the fleeting phase and focus on enjoying your baby because there are many years after to feel fit again. It can be hard to find the motivation, especially with a baby and maybe also toddlers around, and when you’re going off of very little sleep, but that’s when we need that boost from inside the most. 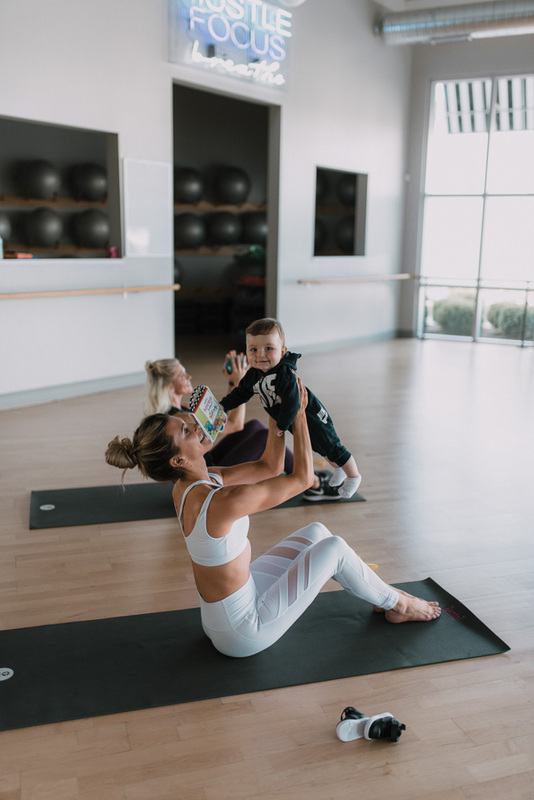 Even if you just try one of these little work outs that involve your baby, you’ll slowly feel more motivated to do more and more. Working out is something I have to force myself to do, but once I finally do it, I’m SO happy I did, and the more I do it the more I want to do it. Make sure to check out Fusion Fitness Youtube for more workouts, also follow Sweat Lab for quick at home series you can try! If you live in the KC area, I highly recommend checking out Fusion Fitness classes, they have 3 locations and are literally life changing! Thanks again to Darby & the Fusion Fitness squad for providing a space that inspires our community, fuels our bodies and kicks our butts! Read more of my fitness and health series here. Great tips! I think it’s so important to help out new moms however we can, especially in fitness and motivation. These are great workout tips, even for non-moms! This looks so great! I think it’s also such a bonding experience for mom and baby. Big thumbs up! Happy to hear! Thanks for stopping by, Nina!